You will quite often hear about men who are not satisfied with the color of their beard. More often than not the beard color differs form the color of a man’s hair. Men with brown and blond hair often have a red beard. Some might be satisfied with the look, while others prefer all their hair to have the same color. Beard color is affected by many factors. Some of them are bad habits, such as alcohol and cigarettes. The rest is age, hormones and time of the year. With time color can change and become irregular. With age many men will have to deal with a silver beard. So, what do you do ifwhen you are not satisfied with the color of your beard? Many men choose dyeing to solve the problem. Being unhappy with your look is one of the most upsetting emotions. That’s why many men are ready to do just about anything to get their beard to look great again. Over the years they get used to the facial hair, which took so much patience to grow and maintain, that they don’t even want to hear about shaving it off. Dyeing a beard is much harder than doing the same to the hair on your head. The first thing to rememberer is that regular hair dye is not a good idea for beard coloring. The ingredients used in regular dyes might negatively effect the sensitive skin on your face and might cause chemical burns. 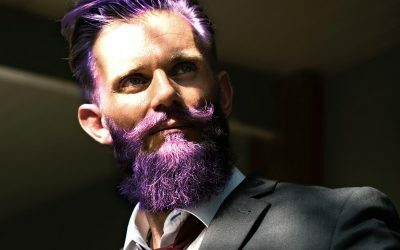 So, if you have made a choice to change your beard color, look for special beard dyeing products. If you are not sure that you can do it yourself, make a beauty salon appointment. In fact, even if you think that you can deal with beard dyeing just fine, we still recommend visiting a salon at least for the first procedure. You will need to get some experience and the best way to do is look at how professionals do their job. Once you get a good idea of what needs to be done, you can continue to do the dyeing on your own. The beard color needs to be touched up about once a week. You can do some experimenting with all kinds of colors. However, whatever beard color you choose, don’t forget that professionals don’t recommend it to be more than 1 shade darker than your natural color.